One of the best ways to get the most value on life science marketing opportunities and sell lab supplies in Massachusetts is to register early for the Harvard University life science marketing event. The Boston BioResearch Product Faire™ Event will take place on April 24th, 2014. By registering before January 24th, 2014, you can save on the price of exhibiting and beat the crowds if this event sells out. Last year, the Boston BioResearch Product Faire™ Lab Product Expo attracted 305 attendees. Of these event visitors, 144 were purchasing agents, professors and post docs, and 30 were lab managers. The balance of attendees was research associates and postgraduate students. 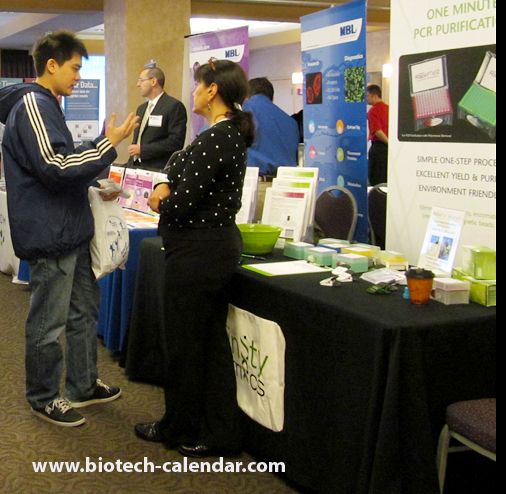 Biotechnology Calendar, Inc. life science marketing events attract crowds of visitors because our events are both professional and fun. Researchers get the chance to learn about the best life science equipment on the market while socializing with colleagues and enjoying a free catered lunch. Registering early for our Harvard University life science marketing event will save you money that can be spent on optimizing your marketing at this well-funded university. Our sponsorship and advertising packages include significant benefits that can help you increase your brand recognition with Harvard researchers. For more information on sponsorship opportunities, see our article Increase Laboratory Product Sales with Event Sponsorships. The universities we work also have the advantage of being well funded. In 2012, the NSF awarded Harvard University $55.3 million in research funding. The NIH also awarded Harvard University $352.9 million in 2013. For the convenience of our readers, we’ve put together a list of life science departments receiving NIH funding. More stats are available at NIH. If you are a lab supplier looking for ways to save on life science marketing opportunities at Harvard University, we invite you to register early for our Harvard life science marketing event and sell lab supplies at this well-funded university. Make sure to register by January 24th, 2014 for the Boston BioResearch Product Faire™ Event, which will take place on April 24th, 2014. Biotechnology Calendar, Inc. is a full-service science research marketing and events-planning company. If you would like to market lab supplies to researchers at universities across the country, please see our 2014 calendar. For more information on the Boston BioResearch Product Faire™ Lab Product Expo, or to learn more about Harvard University funding statistics, click on the button below.